New PowerNow battery chainsaw weighs 11 pounds and offers long run time with no-fade power. Blount, Inc., introduced the Oregon PowerNow cordless electric chainsaw recently, and notes its lithium-ion battery power pack makes "electric chainsaws" worthy of note for the first time. With the ability to cut up to 250 two- to three-inch branches on a single charge with the Endurance battery pack, the PowerNow offers extreme portability in an 11-pound package, and the quiet convenience of a saw that operates only when the trigger is pulled. The PowerNow features a 14-inch bar and chain (self-sharpening) and the standard 40-Volt battery pack or the Endurance pack hold a charge for months. 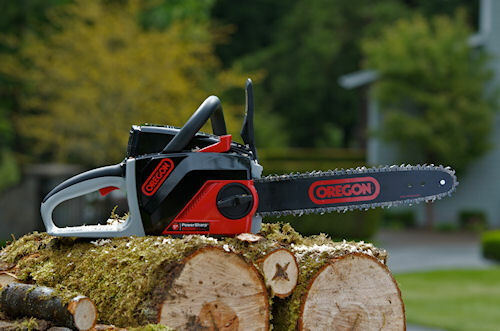 The Oregon PowerNow 40V MAX cordless electric chainsaw uses a lithium-ion battery to provide quiet, long-running cuts with an 11-pound operating weight. The built-in sharpening system allows the operator to sharpen the chain by simply pulling a lever for 3-5 seconds while the chain is in operation. With no fuel to spill and no cords to pull, the PowerNow can ride conveniently in pickups and on ATVs for convenient use when necessary. For more information, call (888) 813-8665.